Ministry of Electronics and IT, yesterday, launched a National Challenge for Youths, "Ideate for India - Creative Solutions using Technology". Ministry of Electronics and IT, yesterday, launched a National Challenge for Youths, "Ideate for India - Creative Solutions using Technology". 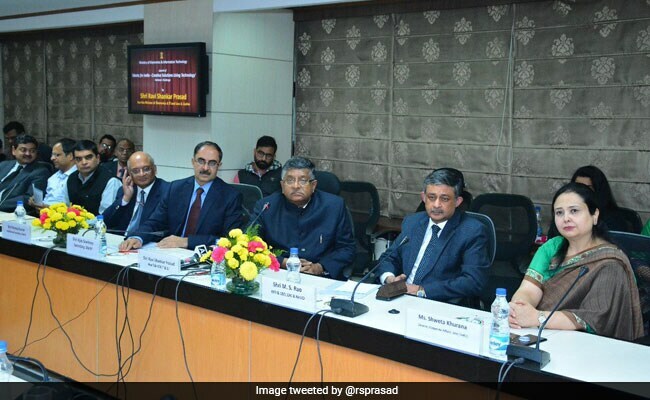 The Challenge launched by Mr. Ravi Shankar Prasad, Minister for Electronics & IT, Law & Justice will provide a platform to school students to become solution creators for the problems they see around them and their communities. The challenge aims to encourage school students to create new indigenous technologies to solve local problems in their community by re-imagining solutions. The Challenge has been designed and launched by the National e-Governance Division, Ministry of Electronics and IT in collaboration with Intel India, with support from the Department of School Education and Literacy (DoSE&L), Ministry of Human Resource Development. Minister for Electronics and IT also tweeted about the launch event. The Department of School Education and Literacy will help reach out to State Education Departments, NVS, KVS and CBSE authorities to popularize the competition in schools across the country. Elaborating the purpose of the challenge Mr. Ravi Shankar Prasad said, "The National Challenge is well thought out and aims at conversion of dreams of children into ideas leading to the development of working solutions. I am hopeful that the top 360 ideas i.e. 10 top ideas from each of the 36 States and Union Territories will reflect possible and practical solutions towards solving local citizen centric problems covering welfare issues like agriculture, quality health, quality education, women safety, child safety, assistance to divyang, etc". The National Challenge is open to students of classes 6 - 12 and is expected to reach out to at least 1 million youth over the next 3 months. The 11 core areas in which students can share their ideas- healthcare services, education services, digital services, environment, women safety, traffic, infrastructure, agriculture, social welfare, disability and tourism. The Challenge requires students to access online videos and understand how to identify problems and share a 90 second video explaining the problem and their proposed solution. From the submissions received, around 360 students, 10 students from each state and Union Territory, will be selected by a panel of experts to attend 5 regional Boot Camps organized in North, South, East, West and North Eastern regions of the country (1 in each region). At the regional boot camps, students will get trained by technology experts and mentors to gain a first level/basic understanding of skills such as design thinking, ideation - idea generation, making, do-it-yourself concepts, collaboration etc. with real time hands-on working sessions on basic electronics, robotics, 3D printing and introduction to IOT/Artificial Intelligence. Mentoring will be provided by experts at these camps to ensure that ideas mature as prototypes. The experts will select top 50 students who will be invited and felicitated at a National Level Event to showcase their prototypes implemented in communities and will be declared Tech Creation Champions.